Cotton: Growers intend to plant 13.8 million acres in 2019, down 2 percent from last year. Upland area is expected to total 13.5 million acres, down 2 percent from 2018. American Pima area is expected to total 255,000 acres, up 2 percent from 2018. Compared with last year, 7 States are expecting an increase in planted area, with the largest increase in Arkansas. Upland cotton planted area in Kansas, at 170,000 acres, will be a record high if realized. 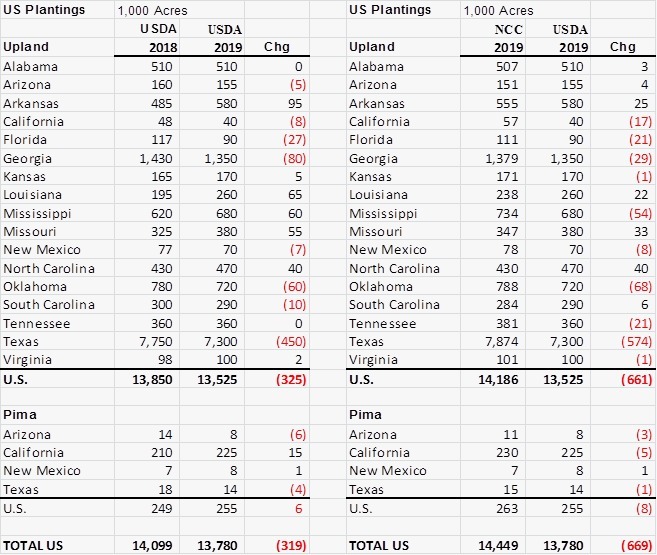 Compared with the previous year, 8 States are expected to plant fewer Upland cotton acres in 2019, including California. If realized, Upland cotton planted area will be a record low in California.